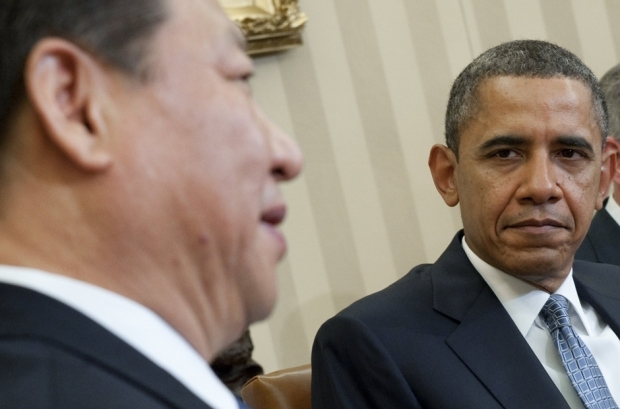 U.S. President Barack Obama, right, listens as then Chinese Vice President Xi Jinping speaks during a meeting in the Oval Office in this archival image from February 14, 2012. With Obama in his second term and Xi now president, the two will convene for informal meetings in California later this week. Five months into his second term, President Obama is about to undertake the most important diplomatic initiative of his presidency: an effort to reshape the relationship with China. With little fanfare thus far but considerable boldness on both sides, President Obama and China’s new President Xi Jinping will hold two days of self-styled “informal” meetings in California later this week. For the presidents of two hugely important countries to hold a summit of this nature is all but unique in recent diplomacy. Moreover, the main purpose of the upcoming Obama-Xi meetings is not to respond to an urgent crisis, but rather to try to reshape the troubled but all-important U.S.-China relationship in a significantly better long-term direction. Expectations must be limited about the outcome of one event in such a complex relationship, but 41 years after President Nixon and Chairman Mao “opened” the present U.S.-China relationship, a kind of re-opening is being attempted. Timing: Presidents Obama and Xi were not expected to meet until September, and then only as a sidebar to the G-20 meeting in Russia. Their meeting now takes advantage of China’s new leadership and President Obama’s recent reelection, creating an opportunity for both countries’ top leaders before old patterns get carried forward. Location: The meetings will take place in Rancho Mirage, California, at the former estate of Walter Annenberg called Sunnylands. Choosing a site like Sunnylands eliminates the need to treat the meeting with all the restrictive formalities of a usual state visit and summit meeting. Format: The format will emphasize extended informal conversations. Three premises drive this. First, informal conversation creates opportunities for the two leaders to develop personal trust. Second, Xi Jinping’s style makes informal and interactive exchange more likely than with his stiffer predecessor Hu Jintao. Third, in current circumstances, more personal interaction is the most promising way for the leaders to find wider areas of common ground and set goals for at least the next four years. What should the leaders discuss if they hope to succeed in reshaping the U.S.-China relationship in a better direction? There is a long list of difficult and contentious issues: trade disputes and stealing of intellectual property; cybersecurity; the U.S. “rebalancing” to Asia and China’s military build-up; dangerous tensions in the South China Sea involving China and some of our Asian allies; disagreements about Iran; climate change; rule of law and human rights; the perennial issue of Taiwan. These specific flash points need to be addressed. But the two leaders have given the meetings a wider framework and will also consider longer term matters. Both countries have already stated an aspiration to build a new model for their relationship. President Xi Jinping has called for “a new kind of great power relationship.” Contrary to some news reports and commentators, pursuing this goal is not a unilateral power play by China. When in Beijing recently, President Obama’s National Security Advisor Tom Donilon used similar words when he spoke about “building a new model for relations between great powers.” At the Asia Society in March, Donilon called for the two countries “to build a new model of relations between an existing power and an emerging one”, adding that “Xi Jinping and President Obama have both endorsed this goal.” The aspiration reflects one of the stark lessons of history, going back to the Peloponnesian War between Athens and Sparta, that an established power and a rising power typically end up in conflict and even war—and it reflects the Cold War struggle between the U.S. and U.S.S.R. A “new model” of great power relations that seeks to avoid these historic patterns is in both countries’ interests. The question, of course, is what the “new model” will consist of, and how historic patterns of conflict can be avoided. Neither country will accept a relationship that surrenders vital national interests – and nothing in the idea of a “new model” involves a pre-emptive compromise of any sort. But neither side has yet put much flesh on the bones of their professed shared aspiration, and they should start trying to do so at the upcoming summit. A new kind of U.S.-China relationship will have to address the mutual, corrosive and escalating distrust between the two countries – such as the widespread Chinese view that the U.S. is trying to contain China’s rise and trying to promote the downfall of the Communist regime, and the growing U.S. view that China is rising economically by pervasive violation of international rules and developing military power to dominate Asia and beyond. The economic relationship between the U.S. and China should be a centerpiece because of the ongoing potential of trade and investment to promote both countries’ prosperity and to create a stabilizing interdependence. Chinese foreign direct investment in the United States is perhaps the largest underdeveloped arena, and it can create jobs and help local economies. Reciprocally, the two presidents also should seek to increase reciprocal opportunities in China for U.S. businesses that reduce barriers and inequities they face, and set goals for completing a Bilateral Investment Treaty. President Obama should explain why following agreed upon “rules of the game” is the proven way to assure mutually beneficial economic competition, and encourage President Xi to engage with this issue. A “new model of great power relations” will also need to address security issues, often thought of as a zero-sum game. As recent U.S. and Chinese cooperation on North Korea’s nuclear program is showing, there are converging interests in the military/security area—particularly concerning nuclear proliferation and potentially in addressing dangerous instability in places like the Middle East—and these need to be identified and nurtured. Security objectives and the terms of co-existence in the Asia-Pacific region are especially hard issues. In light of China’s inevitably growing military power and the U.S.’s permanent role in the Asia-Pacific reinforced by its recent “rebalancing,” can conflict be avoided? Developing a new kind of great power relationship will require the U.S. and China to resolve whether there are strategic doctrines and military deployments that accommodate both China’s protection of its core interests and the United States’ protection of its own interests and defense commitments. A prerequisite is the establishment of robust and reliable military-to-military relationships. Cybersecurity is a new flashpoint in U.S.-China relations that involves both national security and commercial issues, with convincing evidence of extensive Chinese hacking. In fact, both countries are developing capabilities in this area that are greatly de-stabilizing. We have a common interest in working together to develop domestic laws, bilateral agreements, and international rules that constrain the extraordinary dangers of cyberespionage, theft of commercial secrets, and infiltration of crucial infrastructures. This week’s informal summit can at most provide a start to a re-opening of the U.S.-China relationship. We should expect few if any “deliverables,” and the hopes placed on informal discussion may not pan out. However successful this week’s meetings are, coordinated follow-up steps will be essential – and today’s resignation of National Security Advisor Tom Donilon raises the question of who will take over the China portfolio that Donilon had been managing, with uncertainty about the roles of the new National Security Advisor Susan Rice, Vice President Biden (who has an established relationship with Xi as a result of their extensive interactions when Xi was China’s Vice President), and various Cabinet secretaries. But if we believe that individuals, rather than inexorable historic patterns, can shape human affairs, this week’s meetings in California between Barack Obama and Xi Jinping create that possibility.